Choose a page number to see the recommended websites. To find puzzles to print out, click on /French/ in the above menu then "French picture puzzles". Click on the flags for the languages you want, then type a word or phrase into the search field. Comprehensive pack with everything a beginner needs to start learning French, including a book, simple dictionary, flashcards and an audio CD. Colourful book introduces vocabulary, everyday phrases and simple grammar. 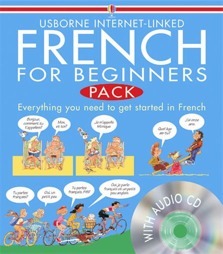 Audio CD has phrases spoken by native French speakers. Includes links to recommended websites with quizzes, exercises, pronunciation guides, games and more. Mon dieu! With this book and CD combo, the kids will be bilingual in no time.